For our third Cubed of 2019 at Queen of Hoxton on Saturday 4th May we have something very special lined up: Xpansions have reformed and will play their first London set in over twenty years! Xpansions was formed in 1990 and was the brainchild of Richie Malone. “Move Your Body (Elevation)” was originally released on Optimism records and went on to reach number 7 in the UK pop charts in 1991, one of the first big dance crossover hits at the time. Move Your Body was then re-released by Arista records in 1995 and again had chart success this time peaking at number 12. During this period Xpansions had twice appeared on the legendary Top of the Pops and several other popular TV shows at the time. Now a bona fide classic, Xpansions was always a regular feature on compilation albums, radio shows and Spotify playlists worldwide with support for “Move Your Body” coming in across the board from the worlds biggest DJs, even to this day! With the recent rise in popularity of music from that era and a new record deal with Shadow Childs “Food Music” this has prompted the group to reform. You may well have heard the track again recently on TV and radio thanks to a certain Suzuki ad! With remixes of Move Your Body from heavyweight names coming soon plus brand new music to follow, 2019 looks set to be a welcome return! 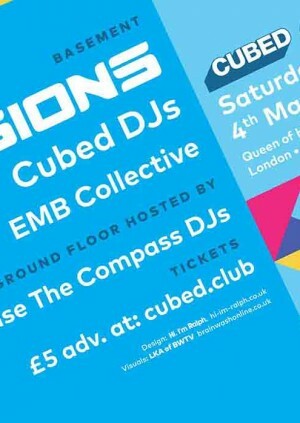 Playing alongside Xpansions in the basement will be Cubed DJs (aka Christopher & Pete, founders of Cubed) and resident party starter EMB Collective of eatmybeatt. The ground floor will be in the safe hand of disco kings (and queens) Chase The Compass DJs.